Are you traveling to the nation’s capital this weekend? Here’s what you can do. The steel barricades have gone up all around Washington, DC, and the US Capitol is being decked out in red-white-and-blue bunting. It’s really happening—Donald Trump will become president on Friday at noon. Hundreds of thousands of people are traveling to the city, and many of them are coming to resist Trump and what he stands for—not celebrate. Venturing that you, loyal Nation reader, might be of the former group, here is a quick rundown of major protest activities in Washington this weekend. This is clearly the headline event of the anti-Trump demonstrations in Washington this week. Potentially hundreds of thousands of people may attend, and march from Third Street and Independence Avenue near the US Capitol following a 10 am rally. It already has the potential to eclipse Trump’s inauguration crowd—200 buses for the inauguration have registered for parking, compared to 1,200 for the Women’s March, according to The Washington Post. The march is not explicitly billed as an anti-Trump demonstration, but clearly it is designed as a response to the election of a president who was revealed to be viciously misogynistic during much of his presidential campaign, from his early outbursts at Megyn Kelly to his repeated attacks on Hillary Clinton’s “stamina” through the now-infamous Access Hollywood tape. 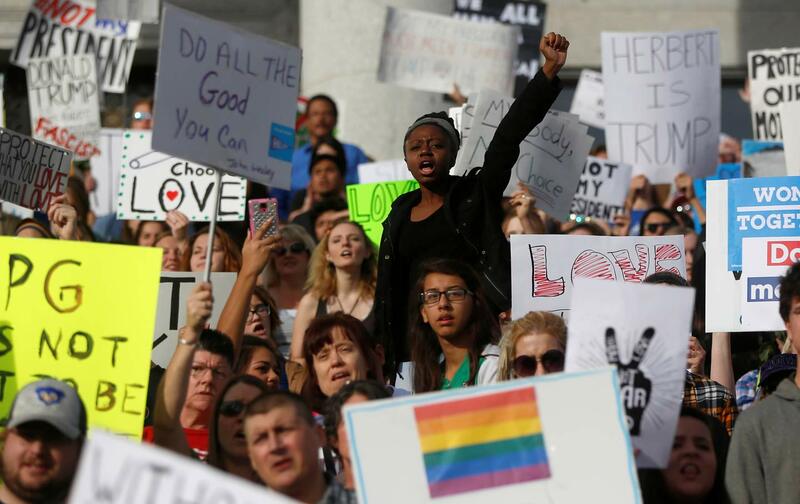 “The rhetoric of the past election cycle has insulted, demonized, and threatened many of us—immigrants of all statuses, Muslims and those of diverse religious faiths, people who identify as LGBTQIA, Native people, Black and Brown people, people with disabilities, survivors of sexual assault—and our communities are hurting and scared,” the organizers say in their mission statement. If you are attending the march, here is a map of various businesses and other locations that will offer “welcome stations” with food, heat, and bathrooms. The pre-Inaugural worship service is a long-running tradition on Inauguration Day. At 10:15 am, Trump will attend services at St. John’s Episcopal Church across the street from the White House. At the exact same time, right down the street at the Metropolitan African Methodist Episcopal Church, a coalition of community-based faith groups will also be holding a prayer service. “With prayers and prophetic witness, event speakers will each offer a word of exhortation to love one another as we love ourselves and to continue the struggle for justice, even in this new administration,” reads the invite. Some groups are taking a more aggressive approach to protesting the Trump inauguration. DisruptJ20 is a collective of grassroots organizers, activists, and, as its website quips, “out-of-work gravediggers.” Their plan is to use civil disobedience and direct action to make bold statements of protest against the Trump administration. The group is seeking hundreds of volunteers to “shut down the Inauguration ceremonies and any related celebrations–the Inaugural parade, the Inaugural balls, you name it. We’re also planning to paralyze the city itself, using blockades and marches to stop traffic and even public transit.” Likely targets include the entrances to the inauguration, bridges into and out of the city, and many of the inaugural celebrations in the evening. The actions will be launched from McPherson Square at 9 pm on Inauguration Day. You can find info on some of the planned events at the group website, here. The incoming Trump administration, and specifically potential attorney general Jeff Sessions, represent a serious threat to state-level legalizations of marijuana in recent years. The many states who have legalized use of marijuana are technically still in violation of federal drug laws. The Obama administration has declined to act, but some of Sessions’s past statements indicate he would be inclined to crack down. The District of Columbia is one such locality that has enacted marijuana legalization. You can possess up to two ounces of weed in DC, as long as you’re not on federal property, like the National Mall. You can’t sell your stash, but you can give it away—like some activists will be doing on Inauguration Day. The DC Cannabis Coalition will start giving the joints away—4,200, to be exact—at 8 am on the west side of Dupont Circle. Participants will then march to the National Mall, and four minutes and twenty seconds into Trump’s address, they will all light up. (This is most certainly not legal.) “We are trying to force Donald Trump to clarify what he meant in picking Jeff Sessions, in terms of marijuana,” a demonstration leader told The Washington Post recently. This is not just a publicity stunt—the group really is bringing all that marijuana. They have been recruiting volunteers in shifts to roll the joints in the weeks leading up to inauguration. The events start at Malcolm X Park in northwest Washington with a rally featuring Jill Stein and several Standing Rock activists, among other. There will then be a march to McPherson Square, and another rally, featuring among others activists and filmmaker Josh Fox. At 5:30 pm there is an “Inaugurate the Resistance” event at the Almas Temple with Seattle City Council Member Kshama Sawant, author Chris Hedges, Jill Stein, and Chase IronEyes, a member of the Standing Rock Sioux Tribe.